State law requires all animal bites from animals with the ability to transmit rabies to humans be reported to the local health department for investigation. Upon receipt of an animal bite report, our Environmental Health Staff issues a written quarantine notice to the owner of the dog, cat, ferret, pig, or other domestic animal capable of contracting and transmitting rabies. The animal can be quarantined at its usual residence or at an animal boarding establishment for the duration of the quarantine. 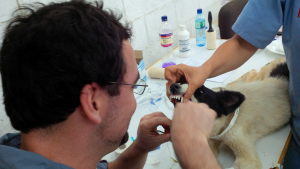 Following the quarantine period the animal’s condition is checked for symptoms of rabies. The animal is subsequently released from quarantine, if properly vaccinated against rabies. At the end of the quarantine period the victim is notified of the animal’s condition. If a problem is found with the condition of the domestic animal involved in the bite or if a wild animal is involved, the animal is humanely euthanized, the rabies specimen collected and the specimen is sent by courier to Columbus, Ohio, for rabies analysis. Q: Why do I need to quarantine my animal? A: The Ohio Administrative Code Section 3701-1-29 requires that any animal involved in a bite must be quarantined for a minimum of 10 days. Animals are quarantined in order to ensure that they are kept away from other animals and people until it can be determined that they are not infected with the rabies virus. Q: Why is the quarantine period typically 10 days? A: The quarantine period is 10 days because animals that are rabid usually die within 1 to 7 days of when they start showing symptoms. Q: What am I not allowed to do during the quarantine period? A: During the quarantine period the animal can’t be given away, the animal can’t be killed, and the animal can’t be relocated outside of the county it resided in when it bit. An animal will not be allowed to be released from quarantine until it has been proven that the animal is currently vaccinated against rabies. Q: Do I have to quarantine my animal at home? A: No, you can make arrangements to have your animal quarantined at a facility like the Warren County Animal Shelter as long as the facility is not outside of the county where the animal normally resides. A: Rabies is an infectious viral disease that is transmitted to humans through bites, scratches, or via the saliva of infected domestic or wild animals. The rabies virus infects the nervous system in mammals and causes aggression (biting for no reason), excessive salivation, and eating abnormal items. Q: What happens if my animal starts exhibiting signs of rabies? A: Contact the Warren County Combined Health District (513-695-1220) and your veterinarian immediately. If the animal must be taken to the shelter please inform them that the animal is currently under quarantine by the Warren County Combined Health District. Q: If I decide to have my animal euthanized or it dies within the quarantine period what happens? A: The euthanized or deceased animal is prepared and shipped to the Ohio Department of Health Laboratory for testing. Once testing results are obtained the health district will notify the affected parties.